Keeping in mind the ever-evolving requirements of our clients, we are devoted towards offering an optimum quality range of Wooden Towel Rack. Keeping the diverse requirements of customers in mind, our company offers excellent quality array of Bathroom Towel Rack. This Bathroom Towel Rack is designed by the team of skilled professionals by using advance machines. Our product range is highly appreciated amongst customers for its rugged construction and optimum finish. • APPEARANCE - QT Constanta Towel Rack with Square Base makes an excellent addition to any home or office washroom. Its modern polished and shiny stainless steel finish makes it both modern and clean looking. The mounting screws are hidden and out of sight. 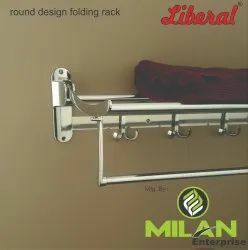 We provide a precision engineered range of folding towel racks. Available in different widths and dimensions with smooth finish, these find application in bathroom decor. Our towel racks can also be designed as per the specifications provided by client.